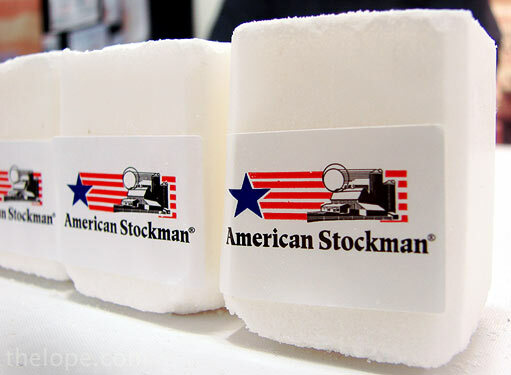 Are you a conspicuous consumer of stuff you'll take home and never use? I am, though I am trying to stop. I'm Greg, and I'm a stuff-a-holic. The Kansas State Fair is a great enabler. The first step in recovery is to only photograph the stuff and not take it. 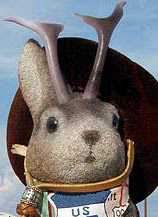 I must confess, though, I slipped off the wagon a few times and took some stuff home. 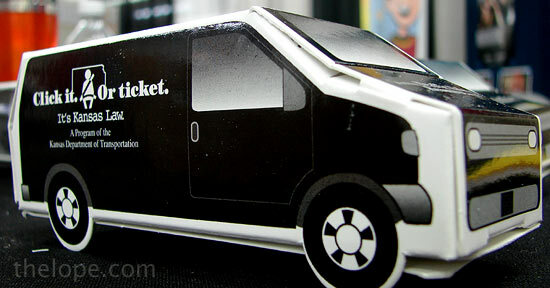 A fold-together cardboard van urges us to use our seat belts. 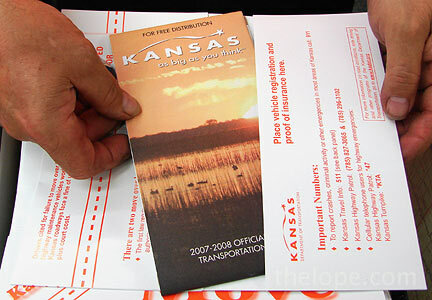 The Kansas Department of Transportation was doling these out in the Eisenhower Building. 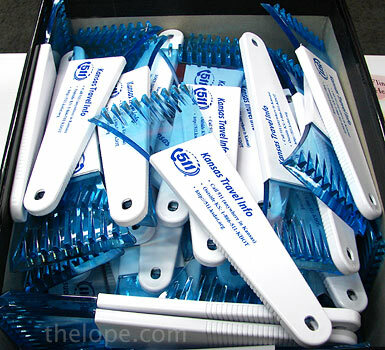 KDOT also had the single most durable - and probably most useful - freebie, a sturdy ice scraper. They also had maps, and these folders which will also hold the registration cops never seem to ask for when I...uh, they also hold insurance and such. Moving on to the Meadowlark Building, the Kansas Farm Services Agency had these little plastic pig banks. they have a slot, but no way to retrieve your money without breaking them (or blowing them up). The Kansas Securities Commissioner booth was giving out blue pigs and I saw one sitting on a table at the K-State booth, which made me wonder if K-State was trying to cross-breed the red and blue pigs to make a purple K-State one. 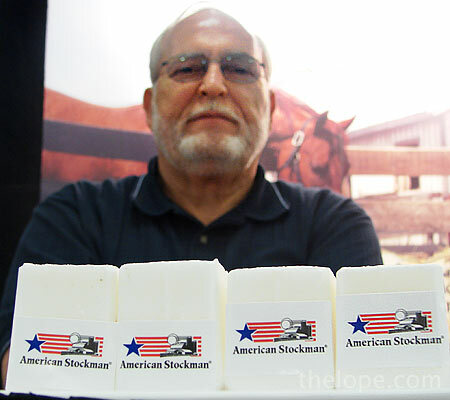 The booth just to the right of Farm Services Agency gave out these miniature salt blocks. I have no idea why I needed one, but I have it. Forgot your toothbrush and just ate some roasted corn? The Kansas Department of Health and Environment can help you out with these free toothbrushes. If a toothbrush won't get it, the Propane booth has toothpicks, so you're all set. 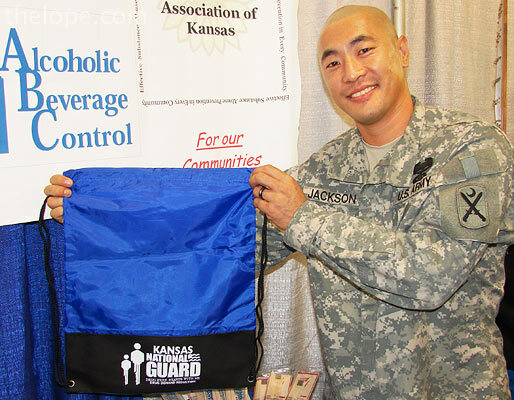 Many booths had plastic sacks, but the Kansas National Guard Drug Demand Reduction booth trumped them all with these very utilitarian nylon backpacks. All you had to do to get one was answer an easy question about alcohol or drugs. I hear the U.S. Cellular Booth has similar ones, but I didn't see them. 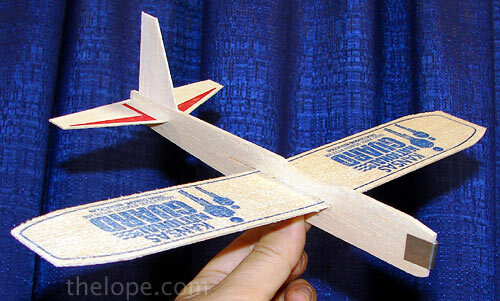 As if the backpacks weren't cool enough, the Kansas National Guard Drug Demand Reduction booth also has balsa wood gliders. They come unassembled so they don't get broken. Also in the Meadowlark Building were these battery operated fans from the Yellow Pages booth. Of course, several booths had cardboard fans, pens, sunscreen wipes, candies, small throwing discs, potato chip bag clips, visors, pill cases and other standard items. 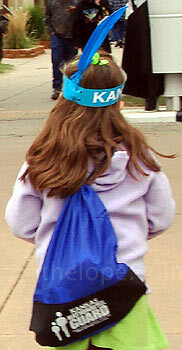 This young fair-goer accessorizes her National Guard backpack with a feathered headdress from Kansas Water. On Sunday, the Democrat booth had Obama buttons - briefly. The Republicans never had any buttons that I saw. I am told that no booth may distribute stickers - a Kansas State Fair rule, I hear. I suppose they don't want to have to be scraping stickers off things around the grounds for a month. 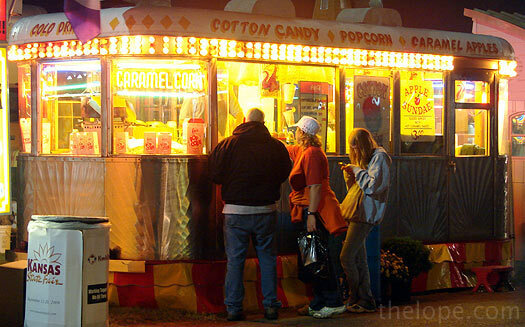 Of course, booths run out of things, and replace them with different stuff. Your freebie mileage may vary. 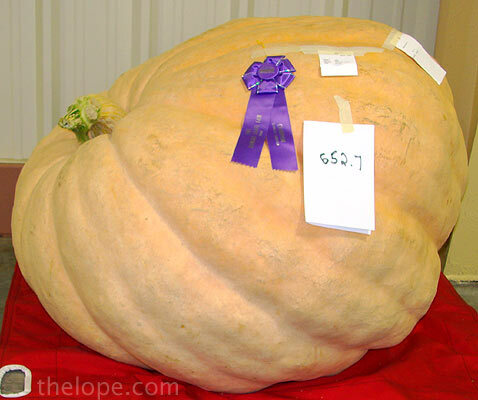 The longest gourd is 81 and 1/8 inches; the tags on the huge vegies were folded so you could not see the winners' names. I'll try to plug those in later. 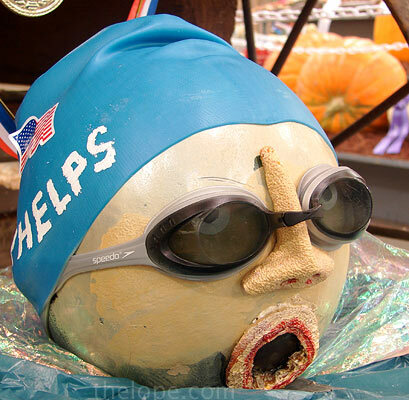 The largest pumpkin weighs 652.7 pounds. 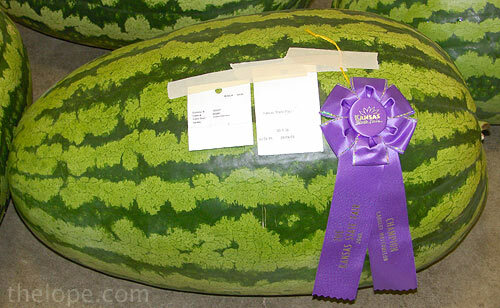 The largest watermelon is 80.9 pounds. 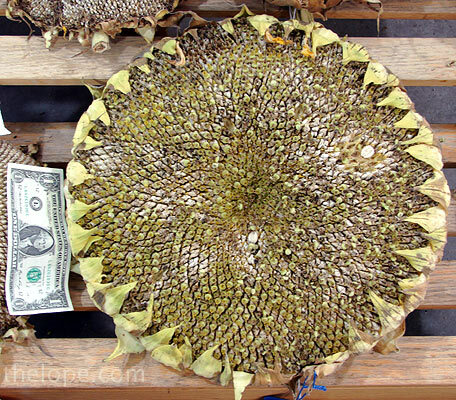 First Place in Largest Tame Sunflower went to Cody Redenbough of South Hutchinson. Look at the size of that thing, compared to the dollar I tossed down. 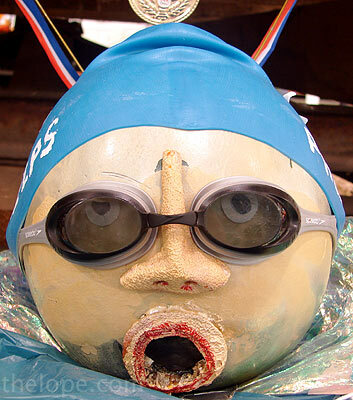 Michael Phelps is immortalized in this caricature gourd by Leann Woleslagel of Hutchinson. She took home her own gold (actually, blue) as she won first in her class. 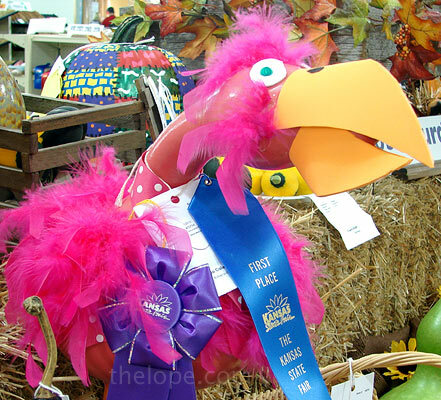 Mary Jo Cole of Kirkland displayed this pink flamingo in the decorated pumpkin class. She won first place. 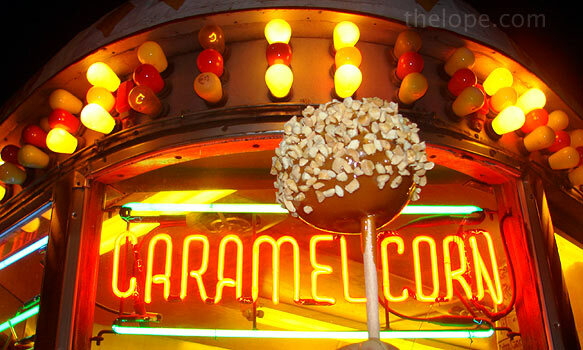 Three bucks will get you a peanut-covered caramel apple at Zag's Popcorn's circa 1952 trailer. I don't know where they come from, and I don't want to know. 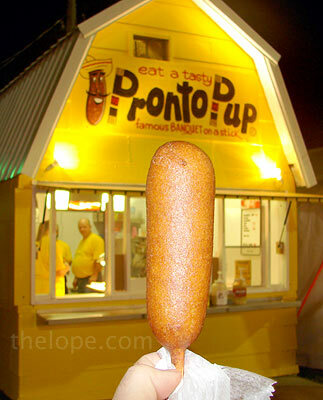 But I got's ta have me my Pronto Pups. I hope she doesn't have a compact car. 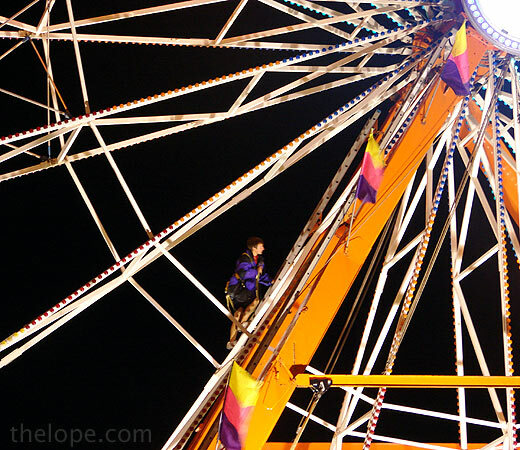 A worker performs maintenance on the Ferris wheel at the north end of the carnival. 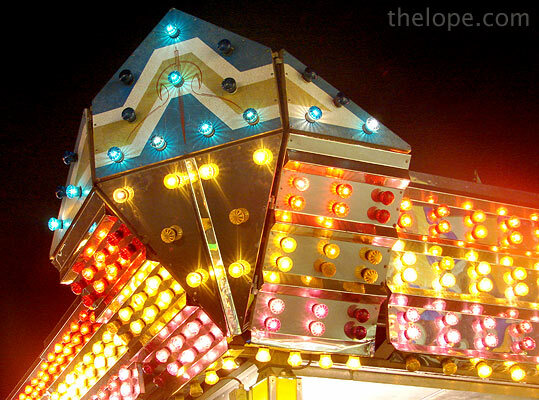 I like wandering the carnival after everything else closes; for the most part, it's filled with nice people having fun. I do this until I hear or see a few incidents of the human condition not at its best - like someone yelling at their kid or a ticked-off pregnant girlfriend storming away from her obnoxious baby-daddy; then I know it's time to go home. 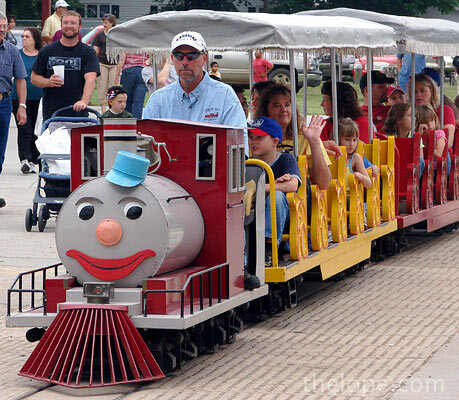 The fair is using both little train engines this year, the more realistic one, and this Thomas-esque version. 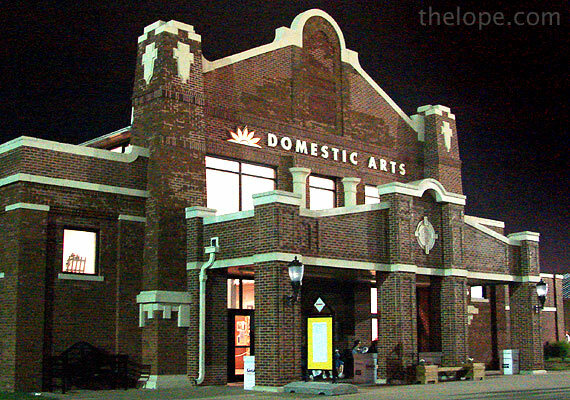 The Domestic Arts Building is a beauty any time of day or night. 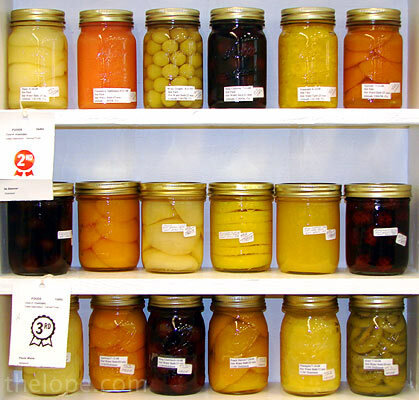 I seldom shoot anything in Domestic Arts, but I liked the subtleties of color in these preserves. 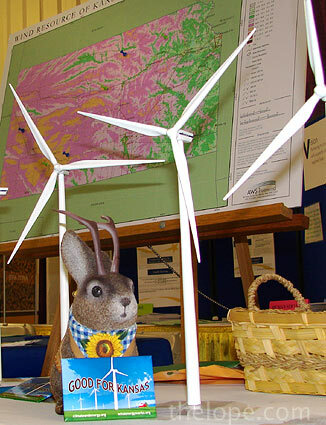 Alas, these model windmills in the Pride of Kansas Building were not freebies. 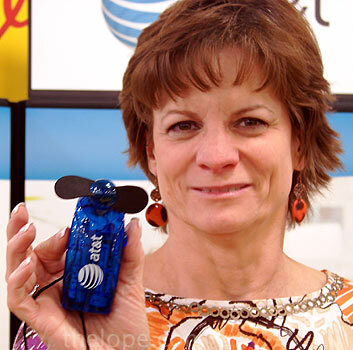 On a good day, I bet I could power a battery charger with one this size. Well, maybe not. 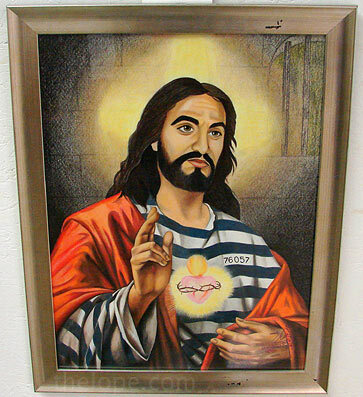 I miss Bob Dole. Time was, he'd stand in what was then the Industrial Building (now the Meadowlark) and say "Would you like a free rectal exam, sir?" My inner dialog response (I never would have said it to him) was "No thanks, your party already does it to me without the KY."
All kidding aside, Bob Dole had a reason for the rather forward offer to middle-aged men, as he was promoting the Red Cross prostate cancer screening booth. It was noble of him, but he stopped doing this the year he ran for president. I would surmise that one of his handlers told him it was a bit too ready-made for comedians, but that's just a guess. 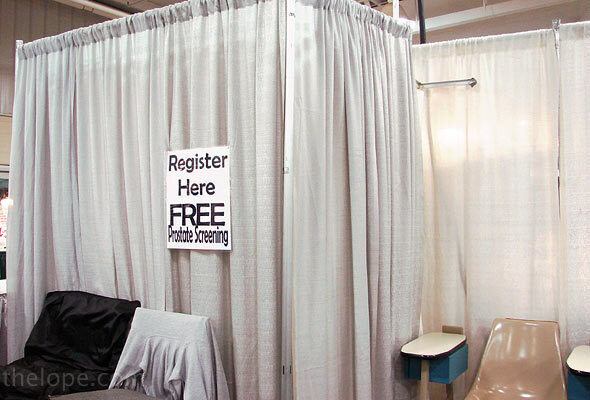 This prostate cancer screening booth is in one of the Sunflower buildings. That's free and potentially life and trouble-saving medical testing, guys. How often can you get that? I can't seem to stay out of the 4-H geology displays. You shouldn't, either. 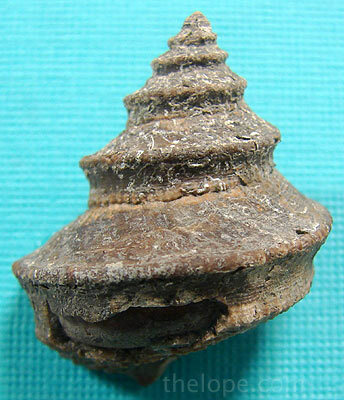 Annie Phillips of Potawatomie has this gastropod, worthinia, from Greenwood County in her fossil display. Stephanie Waln of Miami County displays this amazing specimen of an ammonite from the Plattsburg limestone formation in Anderson County. 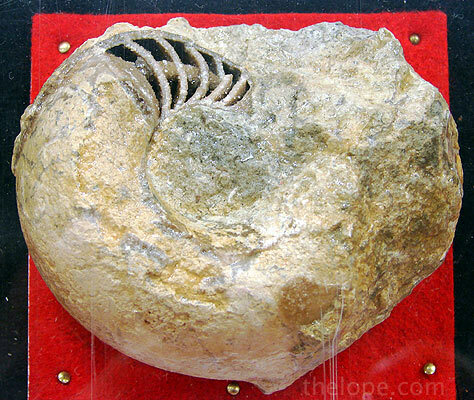 See how this broken section displays how the animal grew by adding chambers like today's chambered nautilus. 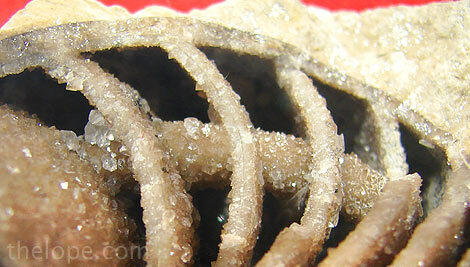 And a bonus - the interior has crystals like a geode. Remarkable. 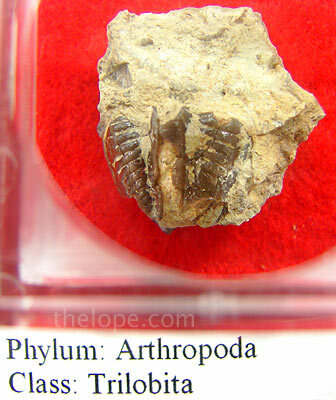 Waln also has this trilobite (ameura) tail from Greenwood County. 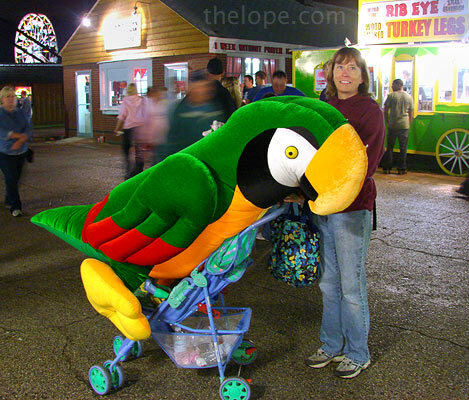 Oh, just a suggestion for creative fun at the fair. 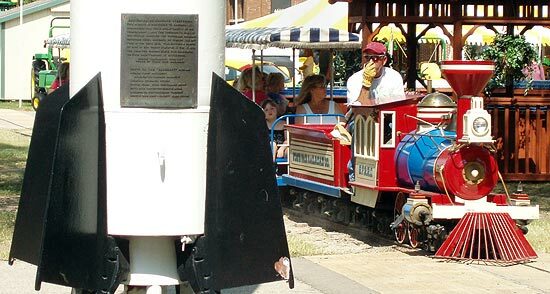 Do a scavenger hunt with your digital or phone cameras. I accidentally hit on this when I shot my 2005 Halloween post at the fair using found places and things to illustrate a passage from Dracula. Here it is. You could do this with your friends or kids with any subject - the alphabet, types of animals, ironies or juxtapositions...your imagination is the limit.